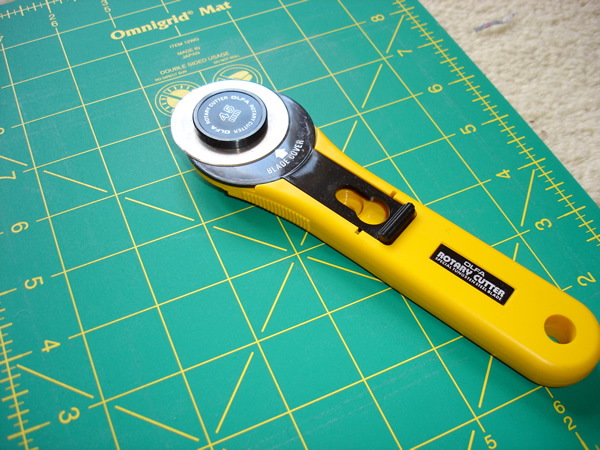 That, my friends, is my new rotary cutter. It arrived in the post at lunchtime last Wednesday… and by 3 o’clock I was at the hospital, bleeding profusely and cursing my own stupidity. Rotary cutters are sharp. Always remember to put the guard on when you’re not actually cutting anything. Do not, under any circumstances, forget to put the guard on and then gesticulate wildly with the cutter still in your hand. Lesson learned the hard way in my case, and hopefully I can serve as a dire warning to others. I did order the sharp blade of doom rotary cutter for a reason. For a while now I’ve wanted to learn quilting because I had a very specific project in mind. I have a rather unhealthy love of pyjamas, and when they get too tatty to be worn anymore I can’t bear to throw them away. I therefore have quite a stash of knackered old pyjamas which are taking up a lot of room. Can you see where this is going? 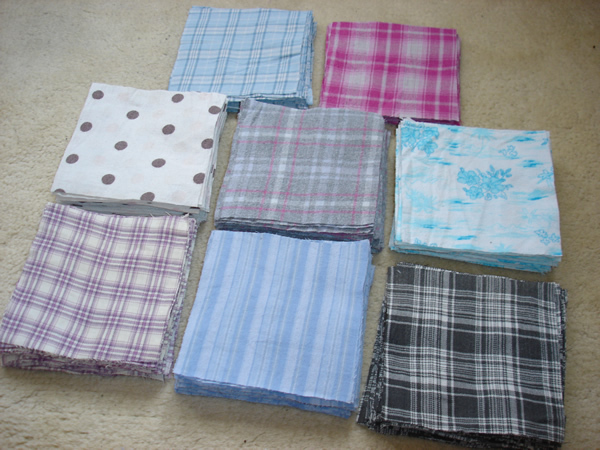 Yup, I want to make a quilt out of my old pyjamas. Nothing fancy in terms of pattern (just squares), but I think the worn fabric will make a lovely quilt, and of course it’s then built of memories too. I’ve got some more pyjamas I need to cut up, but I’ve got a lot on at the moment so the project is being shelved temporarily. I suspect this will be a project I really get to grips with over the winter, when work is quieter. The squares look good so far though, don’t they? This week’s word was chosen by Junebug – pop along to her blog to see who else is taking part. My effort for last week’s word was a bit woeful, so I had grand plans for a much longer post this week. Sadly (or not) June’s chosen word immediately scuppered that. 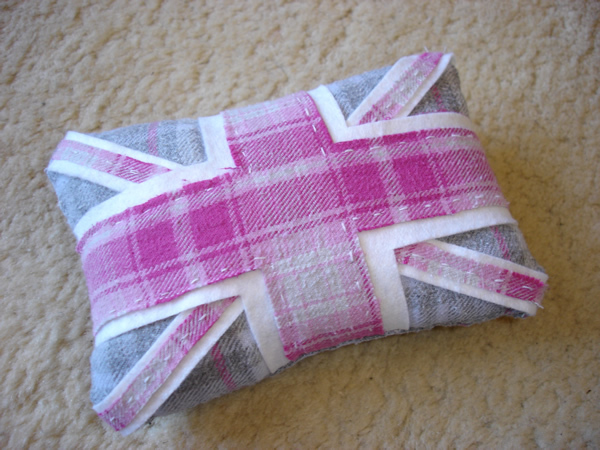 This week’s word was chosen by Sally over at Sow & Sew – pop along to her blog to see who else is playing. Verb: Desire or be curious to know something. I’m shorter on time than I expected to be today, so I’ve created a little word cloud with some things that have caused me to exclaim in wonder in the past. Today I continue in my new theme of recommending fellow crafters, although I think it would be more accurate to call this lady an artist. Charlotte runs Alice & Willow, and she creates beautiful (and well made) corsets and skirts as well as wonderfully designed outfits. She’s just getting ready to launch both her halloween collection and her autumn/winter collection for this year so I thought it was the opportune moment to showcase her wares. A remarkable amount of work goes into each outfit. 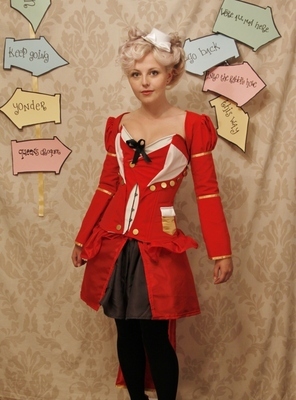 The White Rabbit (above) is the most complicated design as it consists of the most complicated corset Charlotte makes – the Nymph lapel front design – and is a total of 7 pieces: a mini net underskirt, grey mini circle skirt, red bustle skirt, red panier side skirts, red bustle tail, Nymph corset and cropped jacket. 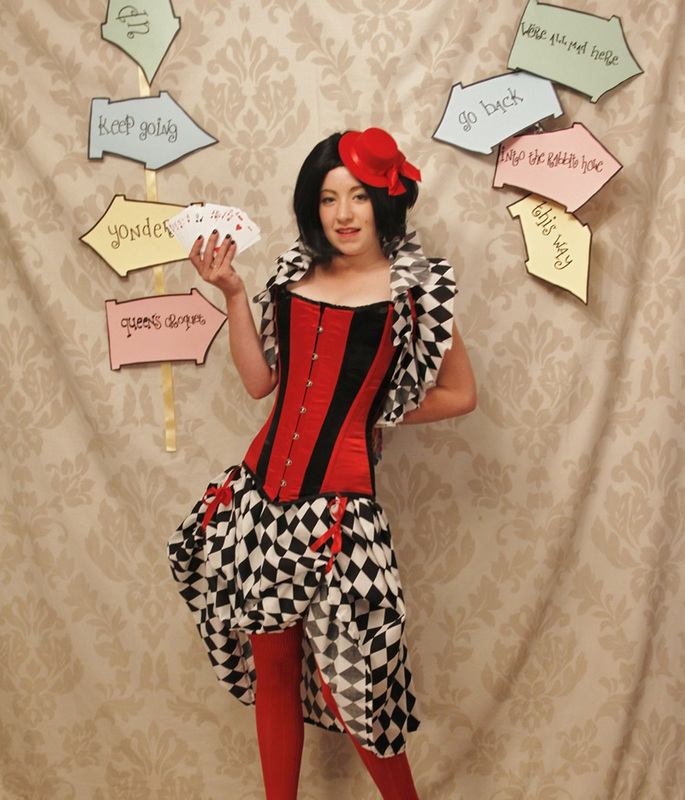 Just as a point of interest, this outfit takes 20 hours to make, and the corset alone takes nearly 15 of those hours due to how complicated the design is. Attention to detail also features heavily in Charlotte’s work. 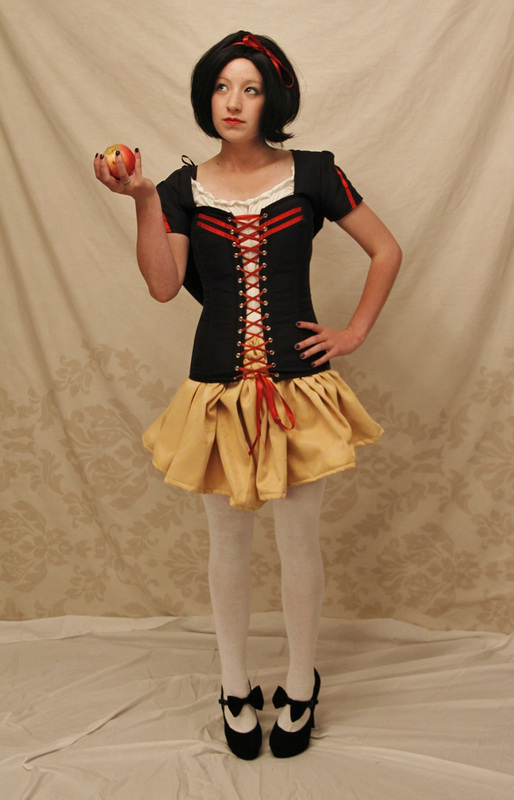 The skirt on this Snow White outfit has parts of a poem embroidered on it, and tells a story if read. Moving away from the fairytale theme there are these Black Swan and White Swan outfits, inspired by the film. To read more about Charlotte’s work please visit her blog or her page on Facebook. I’m not an organised person at heart. I try and give the appearance of being organised, but anyone who’s known me for more than ten minutes will tell you that I’m perpetually scatty and notoriously absentminded. Seriously, I have the short term memory of a concussed goldfish. 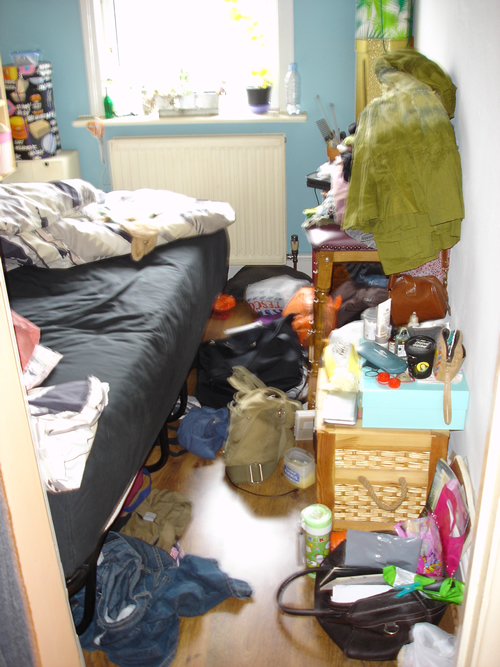 I am also naturally untidy. No, really, I am seriously messy. I’m the sort of person who will start taking off her work clothes as she gets in the door and just drop things where she happens to be standing at the time (my long suffering partner has now accepted that this is unlikely to change and resigned himself to a lifetime of picking clothes up off the floor as he goes). My desk is a disgrace and is usually littered with everything from scraps of paper to half drunk cups of tea and empty crisp packets. I’m a slob. 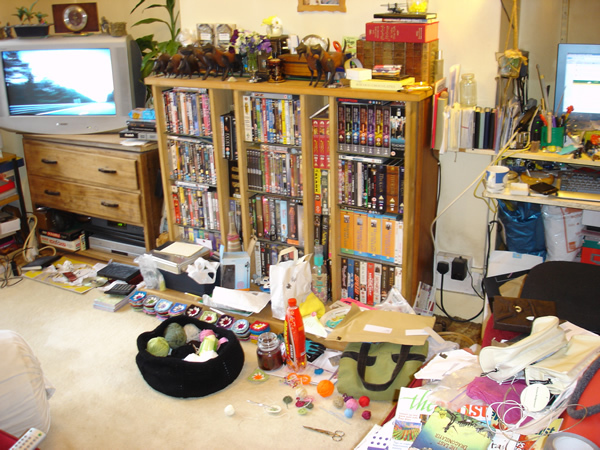 I’ve tried to be tidier, but having a bad memory really doesn’t help. I’ll think to myself “I’ll take that empty packet to the bin when I get up in a minute” … and then promptly forget, even though it’s been less than five minutes since the original thought. It’s frustrating, both for me and the people around me. I make lists of Things To Do and am quite good at sticking to them, but then I get distracted and end up adding even more things to the list and the list eventually morphs from a useful tool to a neverending and somewhat soul destroying blight. 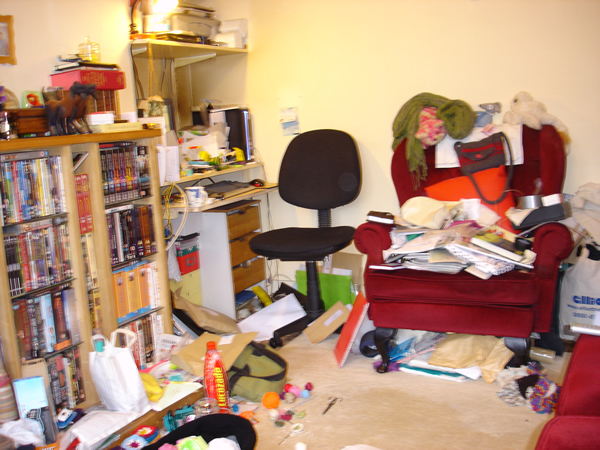 Ladies and gentlemen, welcome to the unholy mess that was my bedroom and living room. I’m somewhat embarrassed to show you but I’m hoping that shaming myself in public will help encourage me not to slip back into bad habits. It took me eight hours on Sunday to sort through the mess. I moved things around (including removing a small set of drawers and replacing them with a filing tray instead), had to rearrange my bedroom somewhat to fit in the vintage trunk I’d bought on impulse that morning, and spent a lot of time peering at scraps of paper bearing mysterious messages and reminders. I also threw out a lot of crap. 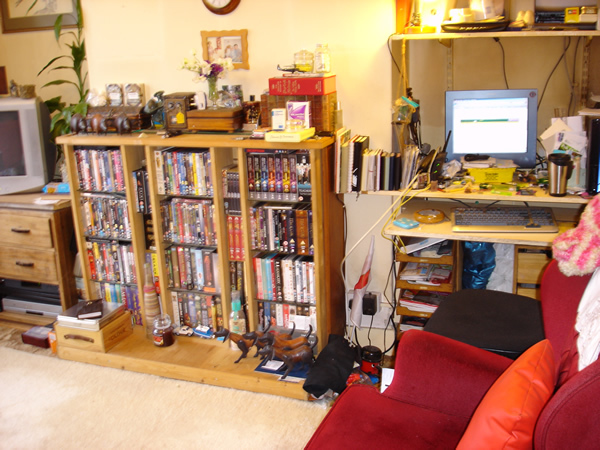 Desk now very tidy, armchair now cleared (mostly), area under desk transformed into a more useful space with the new filing rack, mantlepiece tidied, base of mantlepiece tidied, floor cleared. 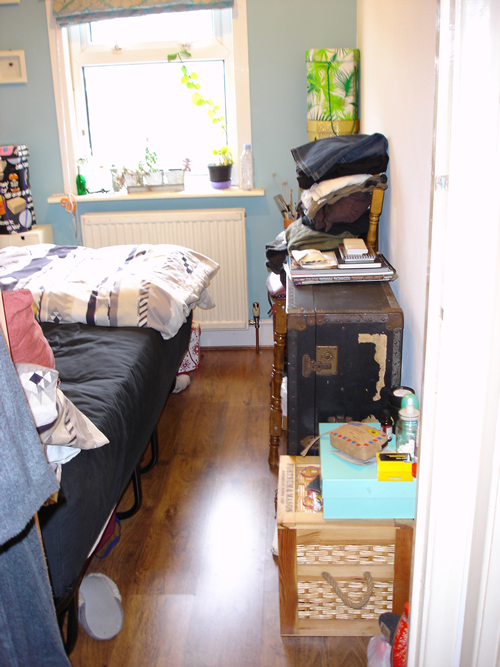 Floor cleared, clothes put away (most of the clothes in the original photo are clean ones that have made it back through the laundry and then just been abandoned because I couldn’t be bothered to put them away), new trunk squeezed in. The road to organisation doesn’t stop there either. I got my book journal up to date, I copied a load of important things from scraps of paper into another journal, copied recipes from scraps of paper into a book I’ve been holding onto specifically for that purpose (it’s only taken me TWO YEARS to get round to this…), copied notes about inspiration and other crafty things into another book, made a start on the gardening journal I was given, and caught up on my filing to boot. 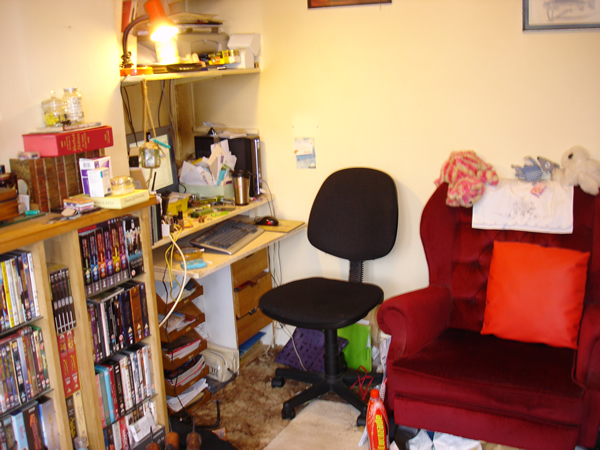 So I’ve made a start at least, and I’m determined to continue keeping things (reasonably) tidy. This includes putting things away immediately after I’ve used them, taking mugs and glasses back to the kitchen after I’ve finished drinking from them, and doing my filing of letters and receipts on a regular basis instead of leaving little piles mounting up for months on end. 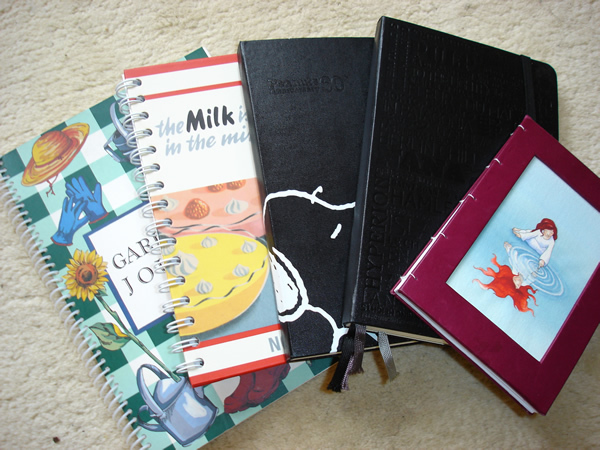 I must also remember to use my various journals and notebooks instead of littering my desk with endless scraps of paper. Will I manage this? Who knows, but I’ll try and revisit this at the end of the year. … at Christmas decorations. Yes, I’m well aware that it’s only September, but these things take time to make so I decided I’d better make a start now rather than ending up in a mad rush in November. This idea started brewing when I realised I still have an awful lot of roving stashed away. 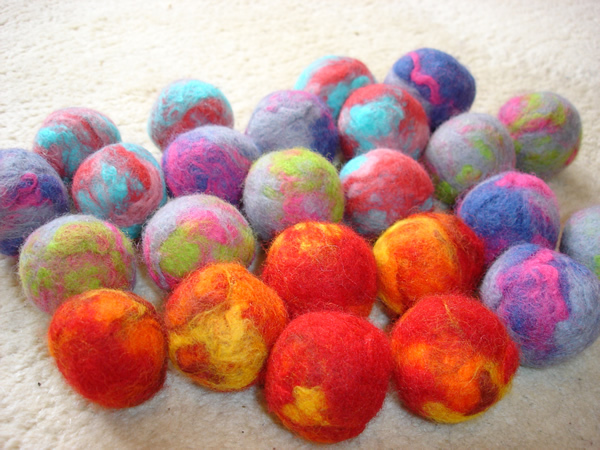 I bought it with the intention of doing some needle felting, but it turns out that I don’t really have the patience for needle felting. That’s not to say I won’t revisit that particular craft at some point, but for the moment it’s not for me. 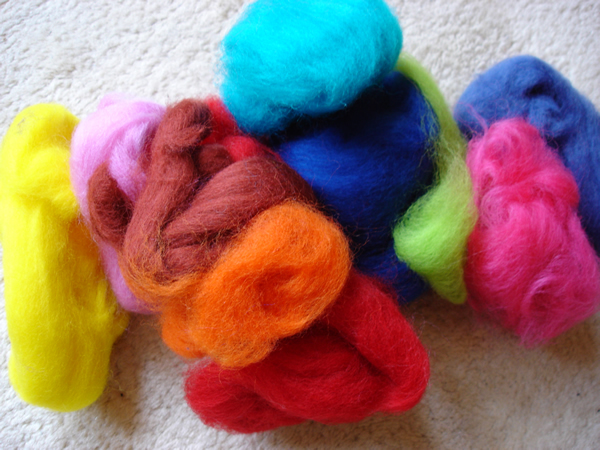 Thus I was left with lots of roving in a multitude of pretty colours. 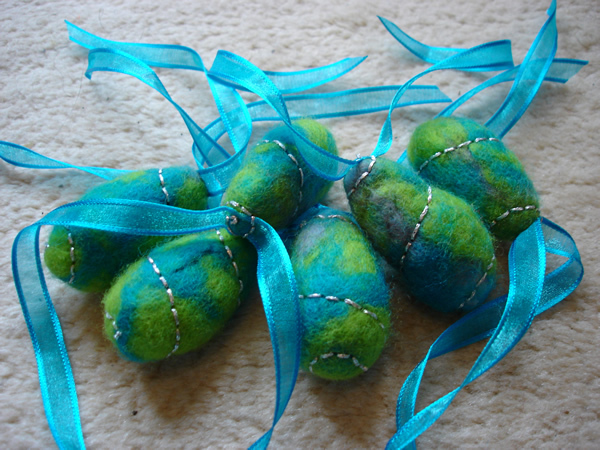 I’ve made a couple of felted bead necklaces (using the wet felting method), which I enjoyed, but making jewellery isn’t very me, so I needed to find something else to make. 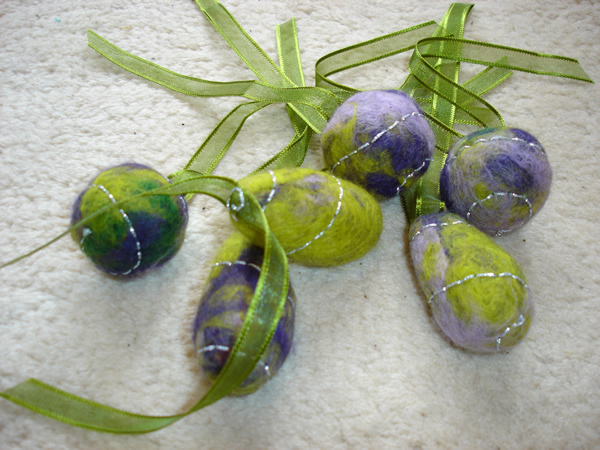 I decided to make felted baubles, which are basically felted beads with added embroidery and ribbons. 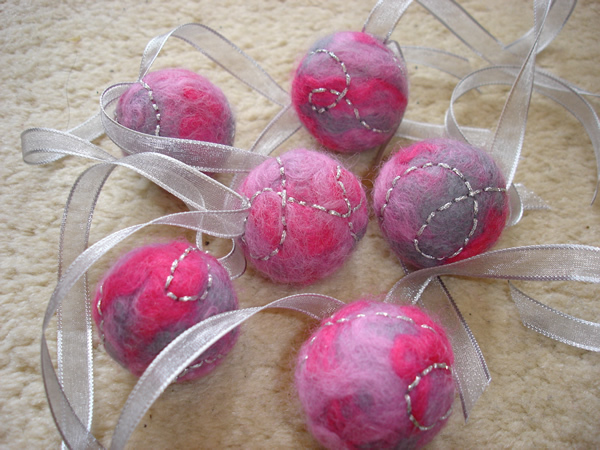 There’s something very relaxing about making these: perhaps it’s the repetitive rolling motion, who knows. So far I’ve been working in jewel colours (I’m still in the throes of my love affair with colour) which are very pleasing to the eye, but feedback so far suggests that people might prefer more traditional colours to adorn their trees so I’ll be making some more in red and green very soon. I thought it was about time I wrote about someone else’s creations, so today I’m going to tell you about a lovely lady called Lise. I know Lise through a forum (Little Lost Lushies), and when not wrangling her truculent toddler she makes beautiful accessories from fabric. 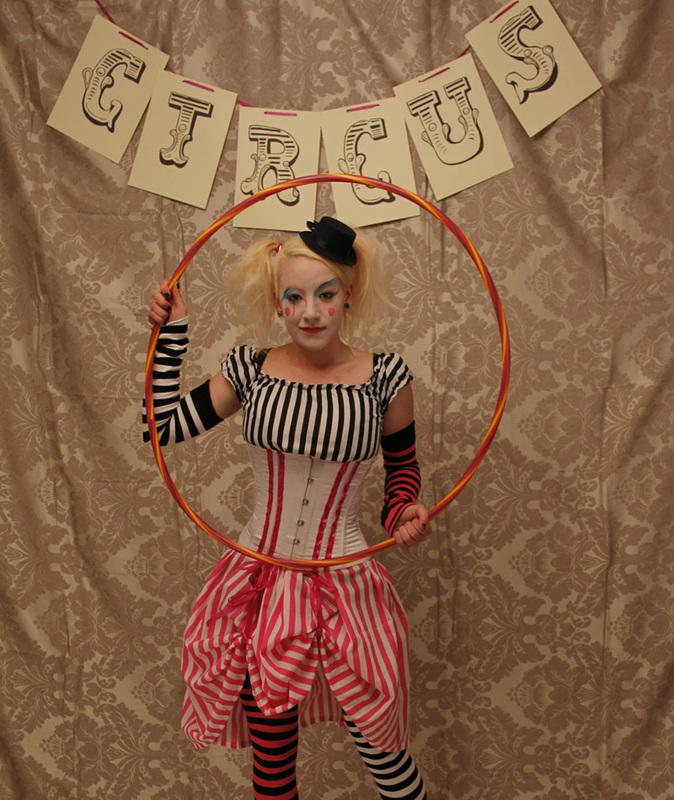 This post is supposed to be an ode to Lise’s creative talents, but I can’t resist recommending her blog at this point. How to be a Domestic Disgrace is a brilliant read – so go and take a look! Anyway, back to the main point – Lise’s work. 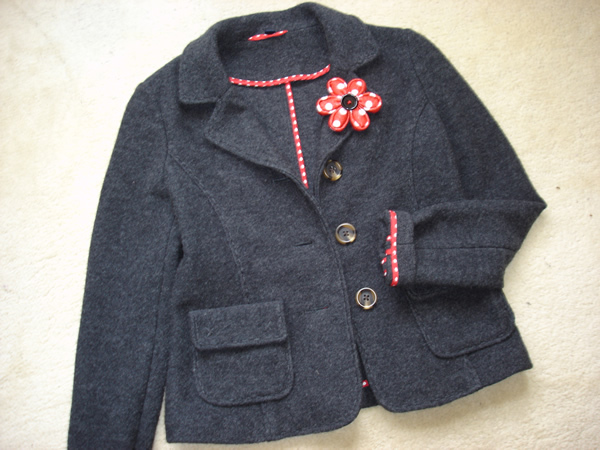 She sells her creations at Belle & the Bean on Folksy. 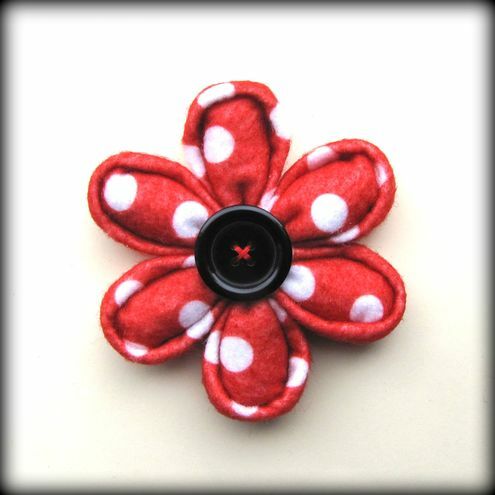 Lots of gorgeous brooches, corsages and hair clips. I generally don’t wear accessories, but earlier this year I was tempted into some hair clips that went perfectly with the dress I’d bought for my birthday, and last month I bought a brooch. I couldn’t resist it. 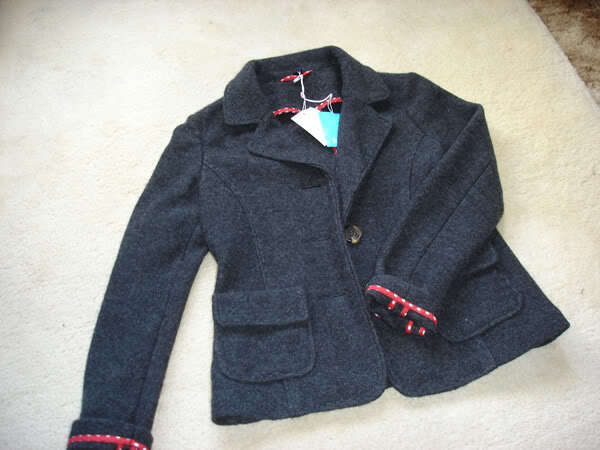 Back in July I was lucky enough to pick up a lovely Boden jacket (brand new with tags!) for just £3 (yup, THREE) at a school fair. I was right, it was the perfect touch and here’s a photo to prove it.